BMW Vision Next 100 – Closer Look at the Exterior, Interior & Drive! BMW Vision Next 100 – Exterior, Interior & Drive! I have to say that I needed a while to stare at a blank point before putting myself together and starting to write this article. The BMW Vision Next 100 is something marvelous, something unseen till now and something other automakers can dream of! The German company BMW is celebrating its 100th anniversary next week, so in that purpose they unveiled their futuristic concept, the Next 100 which they believe will be totally emission-free. This car manages to enter our wildest fantasies, as it is aggressive, surreal and futuristic to the hilt! The guys from BMW eschewed basic car items such as dashboards or rear-view mirrors. However, they have futuristic high-tech alternatives! The car has a shape of a supercar. But, it is more practical, looks more comfortable and as every other big brand nowadays, it comes in two versions – “you-drive” or “it-drives”. The head of the company`s Group Design, Mr. Adrian van Hooydonk, says that everything that you can clearly imagine in your head has great possibility to become reality! The car is fully aerodynamic as it has technology that completely changes the shape of the vehicle from the outside, based on the way the car is driven! The BMW Vision Next 100 has the idea of bonding people and being a car that can engage with them. So, it`s emotional driving, thus – emotional design! The inside look, has also been provided by the company, as we suggest that you watch the video below, now! 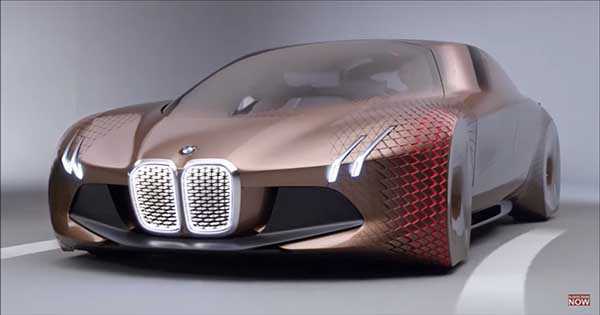 Finally, check out another BMW future concept!